In October 2017 Logan began to have trouble with his throat and developed sleep apnea. He went to see an ENT who diagnosed him with an abscess on his tonsil and suggested a tonsillectomy. Logan went in for a routine tonsillectomy in November 2017 and was diagnosed with Burkitts lymphoma, an extremely aggressive type of non-Hodgkins lymphoma (NHL). Without treatment Logan and his family were told he would only survive three to four months. He had surgery immediately and began intensive high dose chemotherapy. He missed four months of school but was determined to finish 8th grade with his friends, and he did! Logan completed chemo on January 31, 2018 and continues to be in remission. Throughout all of his hospitalizations and everything he had to endure he never lost his amazing sense of humor and positive attitude. Even though he is only 14 he has already decided that he wants to go to college to become a pediatric oncology nurse. 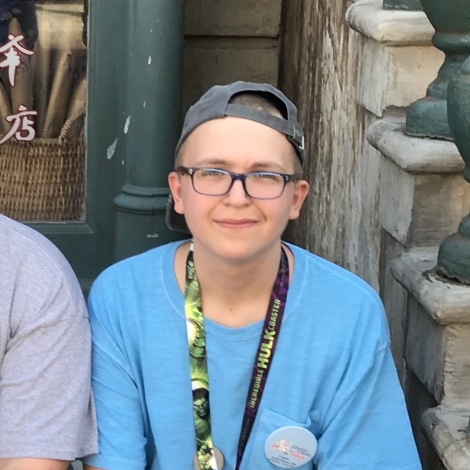 He truly believes that his experience as a child with cancer and now a cancer survivor has given him a very rare opportunity to be able to give back to others and provide support to other kids with a very unique perspective.